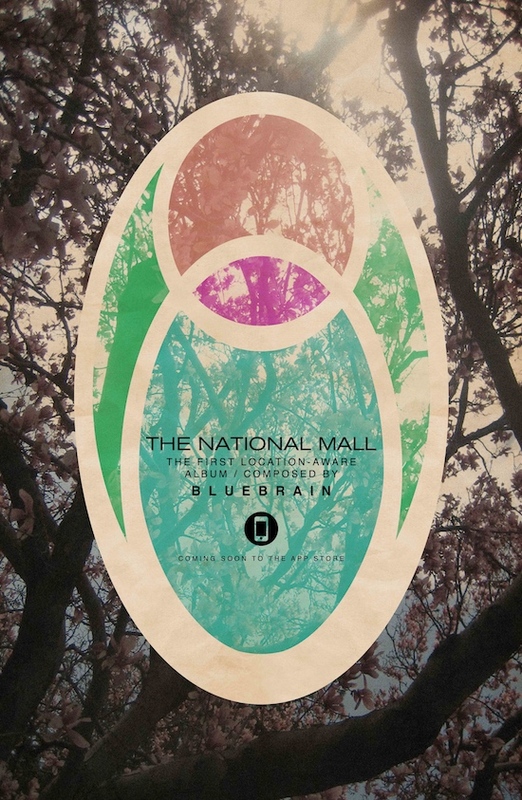 Created by D.C.-based band Bluebrain and released as an iPhone app, “The National Mall” is a smartphone app and album whose tracks mutated based on your location. A map provided in the app serves as a listener’s guide. Bluebrain digitally tagged hundreds of overlapping physical “zones” in the Mall and synced them to various arrangements in the app/album, so that as a listener wanders among the monuments, “the melodies, rhythms, instrumentation and pace of the music vary based on the listeners? chosen path.” A map provided in the app, designed by Danny Jones, serves to guide the listener around the Mall — in fact, the emblem on the cover is based on an aerial view of footpaths around the Washington Monument. But to the band’s immense credit, “The National Mall” “is not an augmented reality application,” they write. “It does not respond to input from the listener. It is not a toy or game… Each position on the map has been carefully considered, the music composed and recorded to be heard in their specific place in the same way you would hear a piece of music on a physical record.” Even the map is not intended as some kind of hipster tour guide, but rather “an impressionist rendering… intended to orient the listener within a landscape largely divorced of its cultural and historical artifacts.” Whatever you say guys! As long as the music is good, we’re happy to take a stroll in your alternate aural reality the next time we visit our nation’s capital.